1. 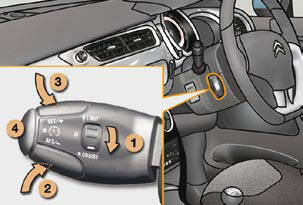 Selecting/Switching off cruise control mode. In order to be programmed or activated, the vehicle speed must be higher than 25 mph (40 km/h), with at least fourth gear engaged on a manual gearbox (second gear on an automatic gearbox). 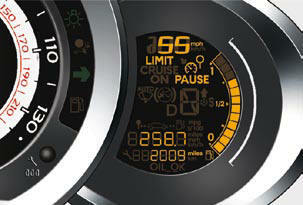 The cruise control or speed limiter mode appears on the instrument panel when it is selected.